The thought of changing your entire diet—and in effect, your life—might seem just a tad overwhelming. It’s possible you’re busy. Extra time and extra money may not be overflowing your days at the moment. Though I tend to be a draw-a-line-in-the-sand kind of girl, I know that doesn’t work for everyone. When I changed my diet, I picked a day and went for it. And I try to stick to it about 85 to 90 percent of the time, which makes it doable for me. If you are not in a place to change everything, I’d encourage you to change something. Add some healthy snacks to your diet. Start exercising a day or two a week. Baby steps are okay. One of my favorite good-things-I-do-for-myself has been my morning smoothie. Molly and Jen got me into this habit, and it’s fairly fast, very filling, and really delicious. Last week I went to a smoothie class with my friend Tina. It was great, and I learned a lot from Krista. I will try to be better about amounts as I have a tendency to throw things in whatever I’m making. This is hard to mess up, and it also depends on how many servings you want. I tend to make myself one giant serving for breakfast. You’ll need a blender or food processor. 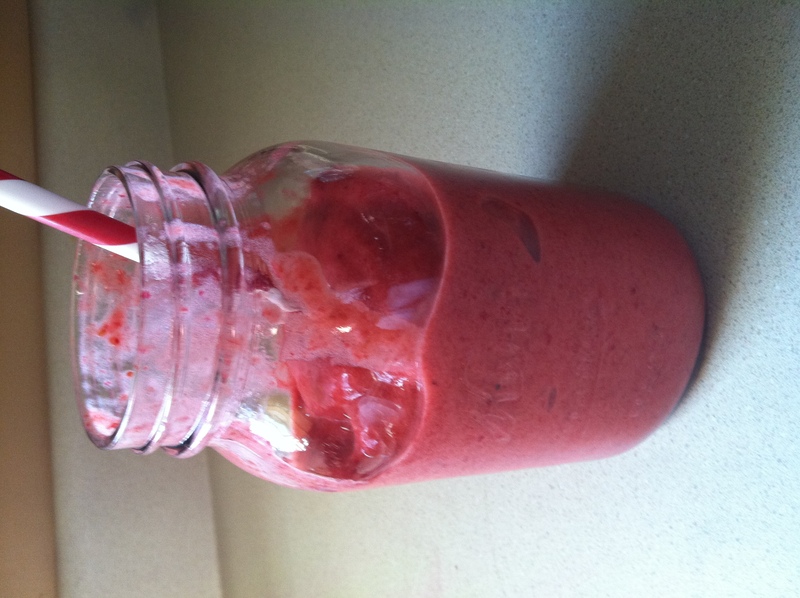 I use equal parts of raspberries and pineapple and then add four to five large strawberries. I throw the frozen fruit in my processor before my morning walk or shower, and then when I’m done it’s thawed enough to blend pretty quickly. Add the strawberries and start with a couple splashes of almond-coconut milk. Blend, and depending on how thick or smooth you like your smoothie, continue to add milk until you reach your desired consistency. Pour or scoop and voila! You’ll have a great breakfast in the most perfectly bright shade of pink. • 2 scoops protein powder (vegan or whey): Kenzi’s disclaimer: this was a little too chalky for my taste; I would prefer one scoop. • 1 Tbsp Spirulina powder. I hope you enjoy! I’d love to hear some of the good things you do for you. This entry was posted in gluten-free and tagged breakfast, chemotherapy, gluten-free, good for you, healthy, Smoothie, snack, treat by kenzihoward. Bookmark the permalink. Yum! We have big green smoothies every day to start our lunch and my sons won’t let me get away without including frozen mixed berries, so really, our “green” smoothies, though packed with kale, mixed greens, spinach, avocado, or whatever, are really bright purple. I love adding fresh organic cilantro or mint, too, for a really bright flavor zing. And we never go without a few splashes of key lime juice. Ooh, thanks for the tips! I would have never thought of cilantro. I’m going to have to add mint to my garden.